This article is about the 1882 Henrik Ibsen play. For the 1978 George Schaefer film, see An Enemy of the People (film). 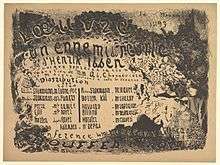 An Enemy of the People (original Norwegian title: En folkefiende) is an 1882 play by Norwegian playwright Henrik Ibsen. Ibsen wrote it in response to the public outcry against his play Ghosts, which at that time was considered scandalous. Ghosts had challenged the hypocrisy of Victorian morality and was deemed indecent for its veiled references to syphilis. Upon completion of the play, Ibsen wrote to his publisher in Copenhagen, Denmark : "I am still uncertain as to whether I should call it a comedy or a straight drama. It may [have] many traits of comedy, but it also is based on a serious idea." The Play opens in Dr. Stockmann's household. Mrs. Stockmann is entertaining the dinner guests. As the evening progresses the Mayor (also Dr. Stockmann's brother) and Hovstad (the editor of the newspaper) have come to the house. Dr. Stockmann and his two sons Ejlif and Morten have come home from a walk. As they all gather in the house, the Mayor needs to confront his brother about an article regarding the town health baths and the rumors that have been raised about them being contaminated. The Brothers get into an argument about their positions on hiding the truth and shaping the truth to get the results that are convenient. Petra (the Doctor's daughter) brings in the letter that her father has been waiting for. After Dr. Stockmann reads the letter, he discovers his suspicions were right and the water from the baths is in fact contaminated. Hovstad now agrees to print the article and unfold the story. This will bring a great deal of attention to the baths and possibly will be the end of them (which will have repercussions on the town's economy). But Dr. Stockmann is overwhelmed with all that has happened and quickly believes he is the savior of the town. The next morning in Dr. Stockmann's house, Mrs. Stockmann gives the news to her husband that his brother Peter will stop by to talk about the baths. Meantime Morten Kiil (Dr. Stockmann's father in law) stops by the house to congratulate him on his discovery and what this will mean to the town. Hovstad and Aslaksen (the printer) stop by the house as well to reinforce their commitment to the doctor and extend their gratitude. The new alliance between the paper and Dr. Stockmann has a deeper interest than just the baths. The paper wants to confront the government of the town and expose the corruption that happens behind closed doors, and this opportunity is a way to start. Peter (the mayor) enters the house, and everything becomes tense. Peter tells Dr. Stockmann that if he proceeds with this article and exposes this information to the town, he will be partially culpable for the ruin of the town. Peter accuses Dr. Stockmann of being selfish and not thinking of the bigger picture. He is encouraging Dr. Stockmann to retract himself from this article and to solve this problem in a more quiet way. The Doctor refuses his brother's propositions and the mayor reiterates that there will be terrible consequences for him and his family. In the newspaper office Hovstad and Billing discuss the pros and cons of running Dr. Stockmann's article bashing the reputation of the government of the town. They are ready to proceed and help bring the privileged classes down. Dr. Stockmann comes into the office and tells them to print the article, but at this moment the whole office has a change of heart and are questioning how valuable is it really to expose the government and the town's baths in this way. They are realizing that printing this article will do more damage than help with the situation. Instead the paper is now on the side of the mayor, and has decided to print a statement of him talking about the baths and how good they are. Out of desperation, Dr. Stockmann decides that he doesn't need the paper to print anything and that he can fight this battle on his own. Dr. Stockmann decides to call a town meeting and spread the information that way. Mrs. Stockmann is present during all of this, and although she knows that her husband is making an extreme decision and is risking his reputation, she stands by his side. At the town meeting in Captain Horster's house, Dr. Stockmann is about to read his water report to the townspeople. Billing, the family, the mayor, Aslaksen, and Hovstad are there. Aslaksen is elected the chair of the meeting to serve as a mediator. What ends up happening is that Aslaksen is trying to sabotage the doctor and stop him from communicating the report. When Stockmann finally gets a chance to speak, he talks about the contamination of the water but also gets into the town leaders and how they are the ones who know what is going on. He talks to the town about education and corruption too. The town feels insulted by these accusations and anger starts growing in the room. By the end of the meeting the town has rebelled as a mob against Dr. Stockmann and have marked him as an enemy of the people. Dr. Stockmann is exiled from the town. It is the morning after at Dr. Stockmann's study. The windows of the house have been smashed. The town has turned against the family, and no one they know will help them. The landlord is evicting them from the house, and Petra got fired from school for having progressive opinions. Peter comes to the house to present Dr. Stockmann with a letter from the board of directors of the baths terminating his contract and a resolution from the householders association stating that no one should hire Dr. Stockmann in this town again. On the other hand, Morten Kiil just bought an interest in the bath business. He expects that because his tannery is causing all the contamination, his son in law Dr. Stockmann will back off and let the issue go because now his family's money is also at jeopardy if he continues this battle. Dr. Stockmann refuses Morten Kiil's suggestions, and also ignores Peter's advice of leaving town for a few months. Dr. Stockmann has alienated everyone but stays true to his principles, even though he is standing alone. Dr. Stockmann knows that his family will always be by his side, and decides to accept his fate and become "the enemy of the people" if that is what it takes to do what is right. Doctor Thomas Stockmann, the medical officer at the new Municipal Baths and the protagonist. Mrs. Katherine Stockmann, his wife. Petra, their daughter, a teacher. Ejlif & Morten, their sons. Peter Stockmann, Doctor Stockmann's elder brother; he is the mayor of the town and thus Thomas' supervisor. Morten Kiil, a tanner (Mrs. Stockmann's father), also known as the Badger. Hovstad, editor of The Peoples' Messenger, the local paper. Captain Horster, a shipmaster going to America and a friend of Thomas Stockmann. Aslaksen, a publisher (also a character in The League of Youth). Men of various conditions and occupations, a few women, and a troop of schoolboys – the audience at a public meeting. In An Enemy of the People, speaking the language of comic exaggeration through the mouth of his spokesman, the idealist Doctor Thomas Stockmann, Ibsen puts into very literal terms the theme of the play: It is true that ideas grow stale and platitudinous, but one may go one step further and say flatly that truths die. According to Stockmann, there are no absolute principles of either wisdom or morality. In this Ibsen is referring indirectly to the reception of his previous plays. For example, the commandment "honor thy father and thy mother" referred to in Ghosts is not simply either true or false. It may have been a truth once and a falsehood today. As Stockmann puts it in his excited harangue to his political enemies: "Truths are by no means the wiry Methuselahs some people think them. A normally constituted truth lives—let us say—as a rule, seventeen or eighteen years; at the outside twenty; very seldom more. And truths so patriarchal as that are always shockingly emaciated." Yet, Ibsen addresses in an engaging manner a number of challenges that are still highly relevant today, such as environmental issues (versus economic interests), professional responsibilities (of experts in policy debates) and, last but not least, the moral dilemmas and tensions involved in whistle blowing. A version was produced for Australian television in 1958. Satyajit Ray's 1989 film Ganashatru, was also based on this play. In 1990, PBS produced the play for their show American Playhouse, starring William Anton and John Glover. In 2007 Ouriel Zohar creates his troupe Compagnie Ouriel Zohar with An Enemy of the People in Paris, an adaptation for two actors only. First performance in Paris, then Fréjus, Besançon in 2008, Liège Belgium Minsk Belarus Valleyfield in Canada 2009, Porto Heli in Greece in 2010. A stage version starring Richard Thomas and Boyd Gaines opened in New York in September 2012. An Enemy of the People (with the subtitle The strongest one is the one who stands alone)—a Norwegian film issued in 2004 and directed by Erik Skjoldbjærg—is an adaptation of Ibsen's play. The play was the indirect inspiration for the blockbuster movie Jaws. In May 2013, the Young Vic theatre in London presented a version by David Harrower titled Public Enemy, directed by Richard Jones. The play was staged in 2013, between October and December, in the Teatro da Comuna in Lisbon. This Audio Book of An Enemy of the People is translated into English by Author: Robert Farquharson Sharp. The source was made available to the public domain thanks to Librivox. This Recording was made in 2013-05-02. ↑ Krutch, Joseph Wood. "Modernism" in Modern Drama: A Definition and an Estimate. Ithaca: Cornell University Press, 1953. Page 11. ↑ Zwart H. (2004) Environmental Pollution and professional responsibility. Ibsen’s A public enemy as a seminar on science communication and ethics. Environmental Values, 13 (3), 349-372. ↑ Bailey, Keith. "The Unknown Movies – An Enemy Of The People (1979)". Retrieved 2010-06-19. ↑ BBC TV's 1980 version of the novel, set in Scotland: IMDB.com website. Retrieved on January 13, 2008. ↑ Bigsby, Christopher. Arthur Miller: A Critical Study. New York: Cambridge University Press, 2005. Print. ↑ Miller, Arthur. Arthur Miller’s Adaptation of An Enemy of the People. New York: Penguin Group, 1979. Print. ↑ "American Playhouse: An Enemy of the People (1990)". Retrieved 2013-03-30. ↑ Baer, William (2008). Classic American films : conversations with the screenwriters. Westport, Conn.: Praeger. p. 208. ISBN 9780313348983. ↑ Al-Ahram Weekly article, English newspaper in Egypt, retrieved 2/10/2013. ↑ Al-Ahram Hebdo article, French newspaper in Egypt, retrieved 2/10/2013. ↑ "Public Enemy". Young Vic Theatre. Retrieved 18 April 2013.